Images on the internet do not begin to do justice to the deep lustrous brilliance of Robert Ransom paintings. His figurative oil paintings combine pure intense color with simple forms that tend to revolve around two or three figures whom faces seemingly display whatever emotion you choose to give them. He began developing this unique style of painting while attending Northern Arizona University as he earned a Master’s degree. Exhibitions of his work soon followed. Ransom’s use of the forced perspective drawing technique captures the essence of the subjects through sheer intensity of form. He creates a powerful boldness and depth by applying the paint in precisely disciplined layers. Robert Ransom is widely considered one of the great pop artists. 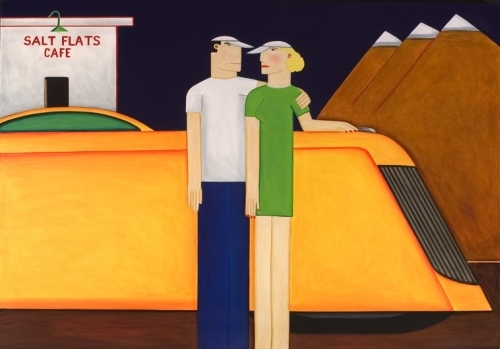 The American Iconography utilized in his work is greatly influenced by The American Dream. Indisputably, Ransom’s appreciation and interpretation of the West is the dominating theme of his work. I consider Ransom to be the Andy Warhol of the American Pastime. Mark Pascal, Curator of the Chicago Art Institute. © 2019 Robert Ransom. All rights reserved.